Dress up your grits with this fun and fresh recipe from food blogger Kiersten Frase. Patience is a virtue that I just don’t have. Every February, I start eagerly awaiting the arrival of spring and by March, I’m stalking the farmers market on a regular basis for the first signs of asparagus and peas and new potatoes. Unfortunately, the fact that I’m ready for spring produce doesn’t matter much to Mother Nature, who always seems to have her own plans. So when I went to the State Farmers Market last month looking for asparagus, I ended up leaving with a big bunch of baby collard greens from Wise Farms instead. I didn’t go to the farmers market intending to get baby collard greens, but that’s the fun thing about going to the farmers market. You might go there with asparagus and fingerling potatoes on your shopping list, but you leave with baby collard greens and lemon bars and bottles of muscadine wine. 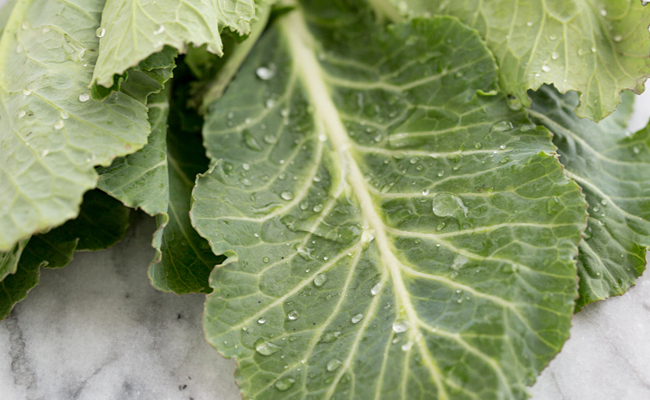 I wasn’t sure what to do with the baby collard greens, but I knew that since they hadn’t matured, they wouldn’t need the long cooking time that fully grown collard greens require—they’re tender and have a milder flavor than mature greens. I sautéed some with browned butter and tossed them with pasta and toasted breadcrumbs, which made a delicious dinner, and then I decided to use the rest in a garlicky pesto. I’ve made this pesto before with raw kale, so I crossed my fingers hoping that it would work out with raw baby collard greens too. And it did! 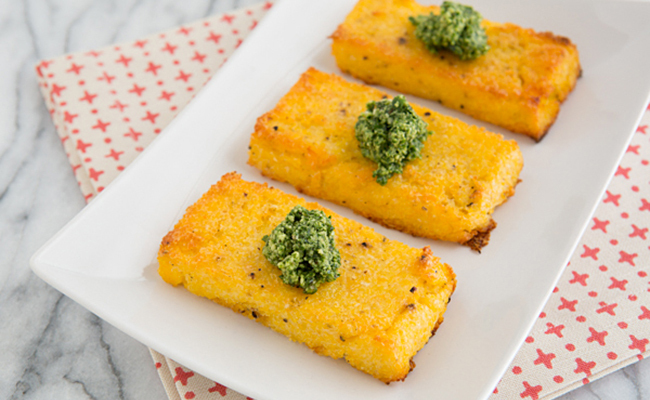 I served the pesto with baked Parmesan and Cracked Black Pepper Grit Cakes. I can never seem to get pan-fried grit cakes right, so I prefer baking them—it takes a little bit longer, but they get that same crispy exterior in the oven as they do in a skillet. 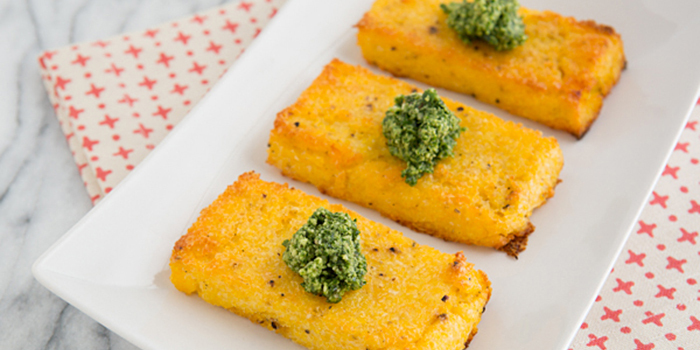 The grit cakes and pesto pair together perfectly and served with a farm-fresh over-easy egg on the side, they make a hearty breakfast for those chilly early April mornings. This year, instead of being impatient for asparagus and peas, I’m going to enjoy what’s in season now. Asparagus might not be ready for a few more weeks, but spring is still here! Combine the baby collards, walnuts, cheese, oil, vinegar, and garlic in the small bowl of a food processor. Process until almost smooth, but not quite—you want your pesto to have a little texture! Season to taste with salt and pepper. Bring the water to a boil in a Dutch oven. Slowly stir in the grits, then reduce heat to low. Continue to cook, stirring constantly, until the grits are thick and creamy, about 12 minutes. Stir in the cheese, butter, and pepper and season to taste with salt. Pour the cooked grits into a greased square baking dish. Use a spatula to spread them into the dish, making sure they’re evenly distributed. Let the grits cool slightly, then cover the baking dish with plastic wrap and refrigerate for at least 3 hours, but overnight if you can. Once the grits are solid, preheat the oven to 450ºF. Brush a baking sheet with light olive oil. Remove the grits from the refrigerator and use a knife to cut them into 8 slices. Carefully remove the slices from the dish with a spatula and transfer them to the baking sheet. Brush the tops with additional oil. Bake the grit cakes for 20 minutes, then carefully flip them over and bake them for 15-20 minutes more, until they’re browned on the edges and have a crispy exterior. Kiersten Frase blogs at Oh My Veggies, a vegetarian food blog with a focus on easy meal ideas made with fresh, whole food ingredients.